WORLDWIDE STUDIO SCORECARD. Again, no changes to the year to date studio ranking of worldwide box office. 20th Century Fox remains #1 and also had the largest gain this week (an okay $87 million weekly gain, mostly because of continued overseas grosses of How to Train Your Dragon 2 and Dawn of the Planet of the Apes). Disney, Warner Brothers and Paramount each picked up around $50 million this past week (primarily because of continued overseas revenue for Guardians of the Galaxy, the domestic release of If I Stay, and continued overseas grosses for Teenage Mutant Ninja Turtles, respectively). 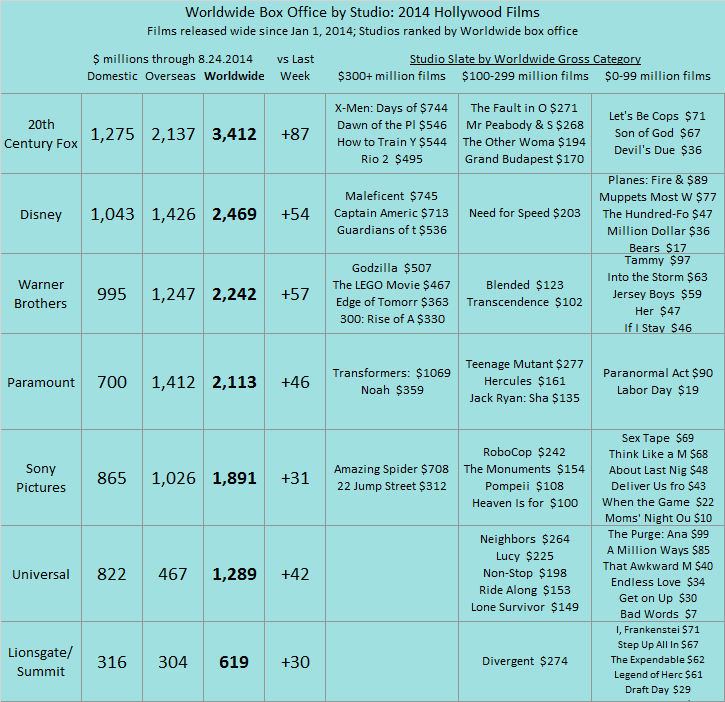 Scroll down for domestic and overseas grosses for each film individually so far in 2014. YEAR TO DATE BOX OFFICE. Looking at North American box office, 2014 is still running -7% behind last year and now -5% below the average for this point the past four years ($6.754 billion). Over the same period, Hollywood films have grossed almost $16.6 billion worldwide when we add overseas box office. The past six weeks in North America are now -7% behind the same period last year (better than the -11% pace last week) and now -8% below the four-year average for the similar six-week period ($1.412 billion). WORLDWIDE GROSSES BY FILM TITLE. If I Stay enters the 2014 worldwide chart at #60, When the Game Stands Tall at #75 and Sin City: A Dame to Kill For at #83. None of the three will climb very far up the chart in the coming weeks because of weekend overseas potential across the board. The big gainers overseas this week were How to Train Your Dragon 2 and Guardians of the Galaxy, which is really starting to kick into high gear internationally.